Figure 19.2. The same microscope field of an IgGκ MM bone marrow sample showing dual populations stained with anti-IgG fluorescein isothiocyanate (FITC, green) and anti-κ tetramethylrhodamine isothiocyanate (TRITC, red). In addition, anti-bromo deoxyuridine (BrdU) FITC (green) staining of nuclei has been performed to show cells in S-phase of the cell cycle. 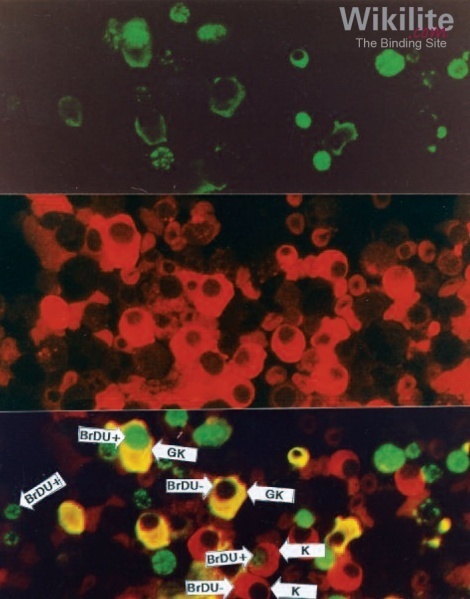 Upper panel shows anti-IgG FITC cytoplasmic and anti-BrdU FITC nuclear staining, middle shows the same field with anti-κ TRITC staining and lower shows a double exposure of the 2 upper plates superimposed to demonstrate double stained IgGκ cells (yellow), κ only cells (red) and S-phase cells with green nuclei. Arrows indicate BrdU+ and BrdU- intact immunoglobulin + cells, BrdU+ and BrdU- κ only cells together with non-plasma cells in S-phase . (Obtained from Haematologica Journal website: haematologica.org). 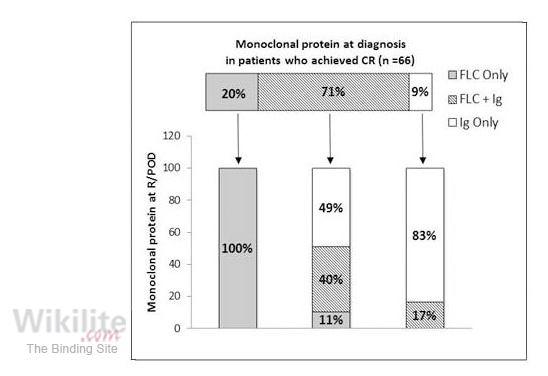 MM patients can be classified according to their monoclonal protein type, i.e. intact immunoglobulin MM (IIMM; Chapter 17), light chain MM (LCMM; Chapter 15) and nonsecretory MM (NSMM; Chapter 16) . 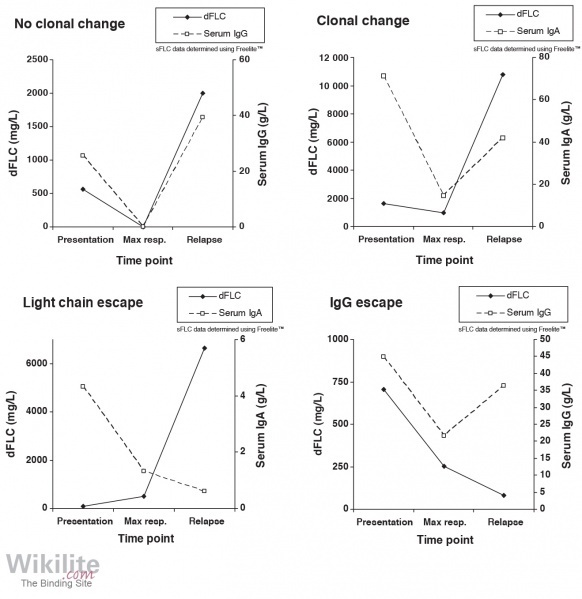 At presentation, 95% of IIMM patients also have an abnormal κ/λ serum free light chain (sFLC) ratio (Section 17.2). The simplest interpretation is that most IIMM patients have a single MM clone producing monoclonal intact immunoglobulin plus free light chains (FLCs). However, specific methods of plasma cell staining have challenged this idea. Ayliffe et al. performed double immunofluorescence staining to study immunoglobulin heavy chain and light chain expression by plasma cells in bone marrow biopsies. The majority of patients had a single tumour cell population that expressed either monoclonal intact immunoglobulins and FLCs (42%), intact immunoglobulins alone (32%), or FLCs alone (8%). However, in the remaining 18% of patients, separate clones expressing either intact immunoglobulin or FLC only were identified (Figure 19.2). These dual clonal populations were the first indicators that, within a single patient, multiple clones expressing different monoclonal proteins could be found. Subsequently, using array comparative genomic hybridisation (aCGH) and fluorescence in situ hybridisation (FISH), Keats et al. elegantly demonstrated the presence of multiple clones in a patient with IgA MM. The impact of these multiple clones is illustrated in the clinical case history below. Further evidence for clonal heterogeneity of MM tumours was demonstrated by Lohr et al. who conducted a next generation sequencing study of plasma cell populations from 203 patients with newly diagnosed MM. The authors concluded that most MM patients have at least three minor subclonal populations in addition to the dominant tumour clone. 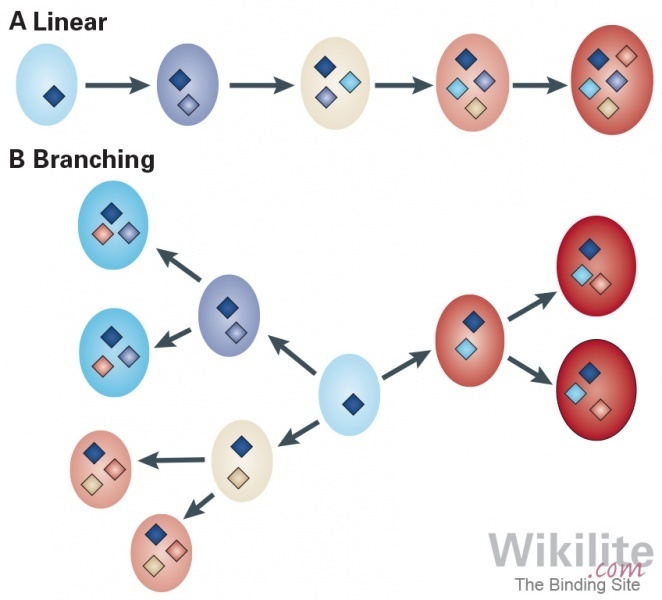 This means that whilst most tumour plasma cells share a common pool of mutations, subclones are present that differ from one another by several mutations . The effectiveness of current anti-myeloma therapies on different clonal populations has been investigated by Campbell and colleagues . The study evaluated 44 patients with biclonal MM enrolled in a series of phase III clinical trials (Myeloma IX, Myeloma XI, and TEAMM). In 32% (14/44) of patients, the monoclonal proteins corresponding to the dominant and minor clones exhibited a similar response to therapy. However, in 43% (19/44) of cases, the response of the dominant tumour clone was greater. For example, a very good partial response or higher was achieved for 61% (27/44) dominant clones but only 45% (20/44) minor clones (p=0.002). Therefore, anti-myeloma therapies may exert a differential effect against dominant and minor tumour cell clones, this is illustrated in the clinical case history below. Campbell et al. also monitored 31 biclonal MM patients in disease remission. 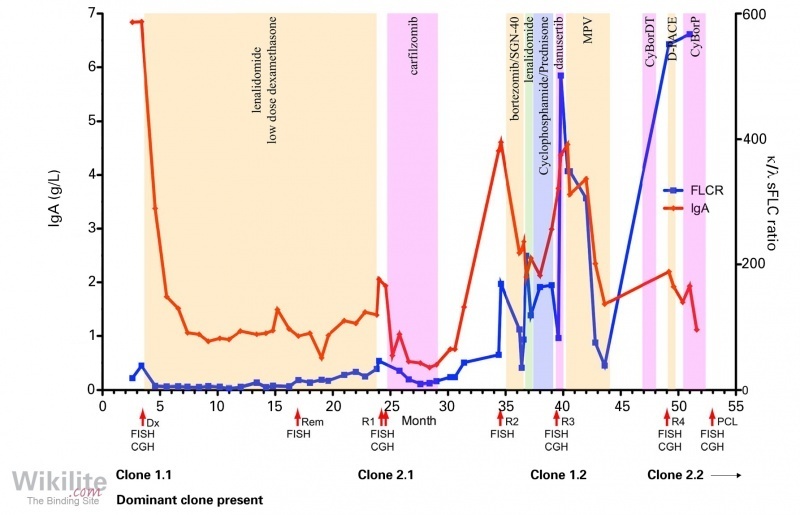 Whilst monoclonal protein concentrations corresponding to the minor clone were initially stable in the majority (90%) of cases, 50% of patients had a relapse of their dominant clone. The authors suggest that response of minor clones to anti-myeloma therapy is of greater duration while that of major clones is of greater depth.